"It is an ill thing for me that you look so like the Huntress - unless I be Orion." "Orion died," said Margaret, turning a cold and rampant brow on him. Shadows and the shadows of shadows flickered swiftly across his face before, as they emerged into a sunlit meadow, it cleared again. "Then mayhap we will rewrite the story," he said, "and Orion will not die." Welcome to the September installment of Beautiful People here at The Penslayer. Last month I chose to do Rede Tuanic from my novel Between Earth and Sky, and he was a real sport about it. 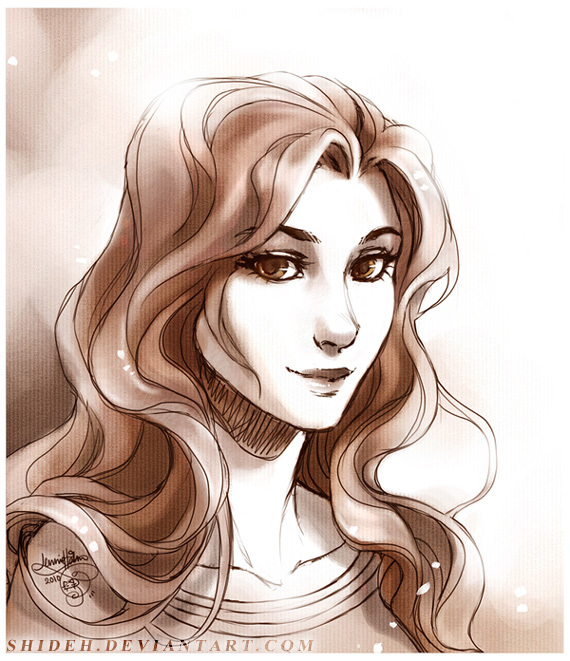 But this month I would like to do a post for the heroine of my fantasy novel Plenilune. She is still coming into her own, and I thought you might like a tiny glimpse of who I am working with these days. 1. Does she have any habits, annoying or otherwise? Margaret is a paragon of good behaviour. She has worked hard to become a model young woman, though on occasion her behaviour seems forced, which can grate against the nerves, and her personality is often cold and reserved, which is not a wholly commendable trait in a young woman. 2. What is her backstory and how does it affect her now? Margaret is the eldest daughter of a sonless family and a great deal depends on her marrying well. Having watched the behaviour of her two sisters and cousin nearly ruin those chances completely, Margaret feels the weight of her responsibilities very keenly, the keenness helped in no small part by the constant reminders of her mother. As a child she was always quiet, reserved, and introspective, to which she added a touch of resentment and, incongruously, a rough kind of justice and mercy as she came into her adolescent years. 3. How does she show love? A cold and constant sort of hate is an emotion Margaret is more accustomed to showing. She is not one to lose her temper easily in any direction so that it takes a great deal to draw out passionate love or hate from her. What she hates she is liable to hate until she dies, what she loves she is liable to die for without stopping to count the cost. 4. How competitive is she? Margaret is extremely competitive, but she doesn’t choose her battles without being sure of some hope of victory. When she is faced with a challenge (i.e. marrying well) she rises to it with grit and poise. 5. What does she think about when nothing else is going on? At home she keeps her mind busy with needlework and reading, and in particularly good weather she will go out for a ride on horseback. Abroad, Margaret spends her time taking walks in solitude and waging her own private war with the torn soldiers of her emotions and convictions. 6. Does she have an accent? As a girl Margaret had a local Lancashire accent, but she has struggled hard to replace it with the southern and more refined accent of the Home Counties. As a result, her voice nestles comfortably and a touch alluringly between the two. 7. What is her station in life? Margaret Coventry comes from an old Saxon family which originally settled in the Midlands; around the reign of James I a branch of the family moved to Northern England and settled down comfortably, which branch Margaret is from. Her family has contained anything from petty earls to landed farmers; her father is the benefactor of her grandfather’s mill investments and they enjoy a well-to-do middle class estate. 8. What do others expect from her? Margaret’s family, and Margaret herself, expect her to marry well and continue to support the social and financial dignity of the family. For this Margaret has no complaint, if only she were not pushed so, and she resents the difficulty the very personalities of her family members present her as they push her to make a good match. 9. Where was she born, and when? Margaret was born in the northern English town of Aylesward in the Year of Our Lord 1822. 10. How does she feel about people in general? In general, Margaret does not usually expend any emotion on people. On an individual level, she thinks of people in extremes, though she may not show it. This cool, subconscious façade is taxed rather sorely in her travels abroad and her temper is worn thin both for and against people, but her basic opinions, once founded, rarely change. Charlie would be thirty-three when Margaret is born... That makes me laugh. I was just going to mention that assessment of Margaret. She's not really that otherwise sweet, charming girl her cousin is. But she's got grit and backbone, and she needs it. I thought of Charlie, but I couldn't remember when Charlie was born, so I couldn't do the math. Well, I have the feeling already that Plenilune is going to be more than worth it. Margaret seems like the sort of girl who will do very well in life, and will enable others to do well, but ... she will be always missing something. Something foolish, something vital, and I think that if no great changes come to her, she will never grasp the essence of life itself. All the same, I rather like her, and I think her crisp and cool personality will make for a fascinating dynamic in the story. Probably this isn't at all relevant, but I somehow get the idea that though she's not at all romantic or obviously alluring, she could make a man ache for a lifetime.